Today I visited the MacArthur Bridge. 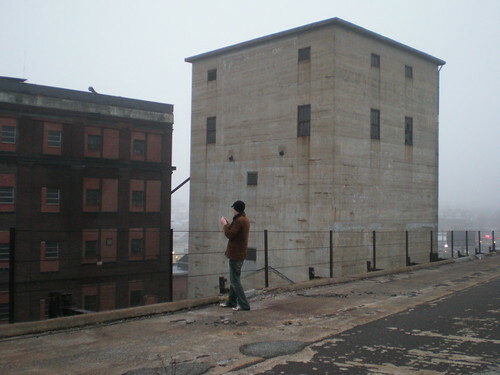 I had been planning a trip along the abandoned road deck of this bridge for some time now, inspired initially by this account of an exploration of the Bridge (which I apparently stole the name of my blog from), and then by other sources such as the Post-Dispatch and Wikipedia. 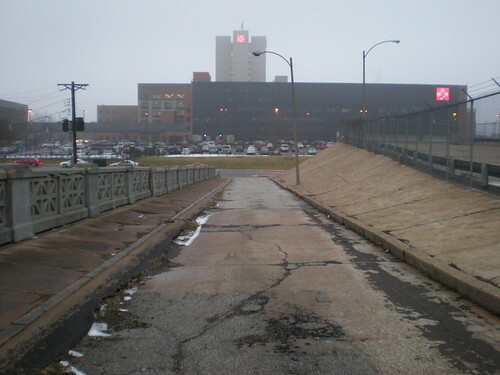 I had of course forgotten to do my homework before driving downtown, but luckily was able to find the entrance to the road deck from Chouteau Street very close to the Eat-Rite Diner. Walking across the bridge was like a trip back to a time where roads didn’t need 10 lanes and trains needed more space than cars. Unfortunately the fog made the city almost invisible from the bridge, which I’m sure on a clear day would afford wonderful views, but at the same time the fog provided isolation from the more modern downtown skyline and allowed distraction free appreciation of the bridge. Along the way is a prime advertising spot which holds many very faded ghost signs. This bridge is a great monument that reflects St. Louis in many ways. The difficulty the city encountered navigating this project to completion is very familiar to us in 21st century St. Louis, as is the bridge’s abandonment as a road in the early 80s. Hopefully this landmark and its struggles will not be forgotten. Here are my photos from the trip. how did you get onto the bridge? over the barbed wire? Or under or around. There’s more than one fence you have to deal with along the way. any tips on the best time of day to try? construction is going all the time. I only went once more than a year ago. I think it was a Sunday but I honestly can’t remember. All I can say is good luck. It really wasn’t that hard to access. I only went once over a year ago. Can’t really offer any advice. 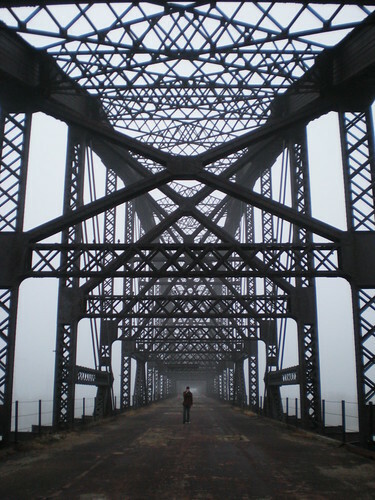 I moved from STL 18 years ago but visit sometimes, and I’ve always been fascinated by this bridge. I had no idea you could actually walk across it! I never tried but I know exactly where that entrance is, it’s very close to where my friend lives. How far across it can you walk on? Because it looks like only part of the roadway is even remaining on it.